LAQ has changed the way they sell their bento heads. They are now selling their main bento HUD separately and you only need to purchase that one time. After that, you can buy as many LAQ bento heads as you like, they will all work with that one single HUD. Head Price: LAQ bento heads are all now only L$1500 each and are available at the LAQ mainstore. The main bento HUD and the skins for the heads are both sold separately. 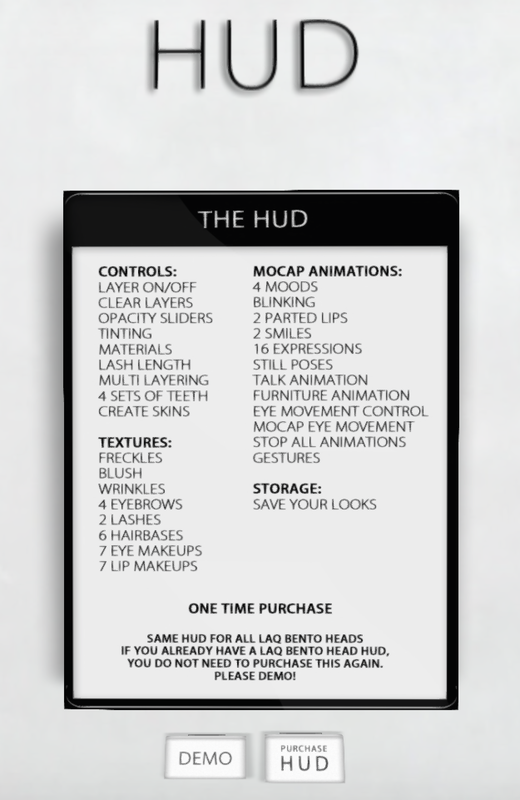 The main bento HUD is L$3000 and only needs to be purchased once for all Laq Bento heads. Body Appliers: You can pick up matching body appliers at the LAQ mainstore for varying prices. At the moment they are on sale for L$25. Omega Compatibility: The skin, tattoo, eyebrows, hairbase, eye makeup and lipstick layers have Omega pre-installed, so no system kit is needed. You can wear any Omega applier of your choice on these head without any relay hud. I’ve been told that the new heads don’t have omega pre-installed and you need to purchase the Omega System Kit for it. Customer Service Questions: If you have any questions about this head, it would be best if you looked at the designer’s profile, her name is Mallory Cowen, to see how she prefers to be contacted for customer service issues as I will probably not be able to assist you with that. You can also join the LAQ updates inworld group to get news, updates, and assistance from the other group members. Other LAQ Bento Heads: Other LAQ Bento heads that I’ve blogged in the past are: Leia, Skye, Scarlet, Rebel, Rina, Neve, Nyx, Lulu, Jade, Ana, and Gaia.